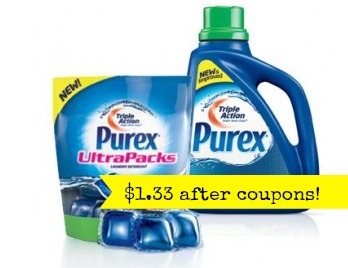 Home > Printable Coupons > Reminder: Purex Detergent $1.33 at Walgreens This Week! Reminder: Purex Detergent $1.33 at Walgreens This Week! I want to remind you of this hot deal at Walgreens this week on Purex detergent! They have Purex bottles. 24-33 loads or the Ultra packs, 18 ct., on sale buy 1 Get 2 Free!! That is already an awesome sale, but then we have two printable coupons to pair in with it. To save the most, buy 3 bottles and use both coupons above. (You are allowed to use coupons on the free products at Walgreens). In the end you’ll pay $3.99 for all three bottles, or $1.33 each!! If you want to take it one step further… that’s 4¢ per load! See all the deals this week at Walgreens.